Why Can't I Access This Web Site? Henry Maier's PC reboots when he tries to shut it down. You can easily fix this common and annoying problem. Unfortunately, it's almost always a symptom of something more serious and more difficult to repair. Here's what's happening: When you shut down your PC, something goes wrong and crashes the computer. By default, Windows reboots after crashing, producing the effect you describe. To my mind, that's stupid behavior, since it masks the actual problem. In a case like yours, when the crashes happen at shut-down, you don't even realize that Windows is crashing. Fortunately, it's easy to change this behavior. Select Start, (Start then Run in XP), type sysdm.cpl, and press ENTER. 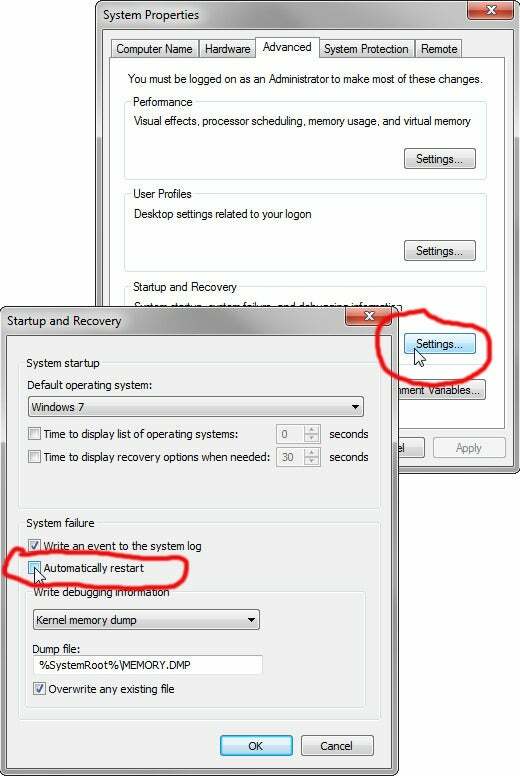 Click the Advanced tab, and then click the Settings button under 'Startup and Recovery' (as opposed to the other two Settings buttons on that tab). Uncheck Automatically restart. With that change, Windows will no longer reboot when you tell it to shut down. But it will still crash. Fixing the underlying problem is much more difficult. If you get any visible error message, study it for clues. If the error message is in the form of a Blue Screen of Death (a blue screen filled with unfriendly-looking white text), see The Blue Screen of Death Blues. It could be a hardware or driver issue. If you added new hardware shortly before the problem started, look for an updated driver. Or try removing the hardware and uninstalling the driver to see if that helps. To do so in Vista or Windows 7, click Start, type event logger, and press ENTER. In the left pane, expand the Windows Logs section, the select System. If you're using XP, click Start, right-click My Computer, and select Manage. In the left pane, expand Event Viewer and select System.